Attica Locke is the author of Pleasantville, which won the 2016 Harper Lee Prize for Legal Fiction and was long-listed for the Baileys Women's Prize for Fiction; Black Water Rising, which was nominated for an Edgar Award; and The Cutting Season, a national bestseller and winner of the Ernest Gaines Award for Literary Excellence. She was a writer and producer on the Fox drama Empire. A native of Houston, Texas, Attica lives in Los Angeles, California, with her husband and daughter. "Locke, having stockpiled an acclaimed array of crime novels (Pleasantville, 2015, etc. ), deserves a career breakthrough for this deftly plotted whodunit whose writing pulses throughout with a raw, blues-inflected lyricism." 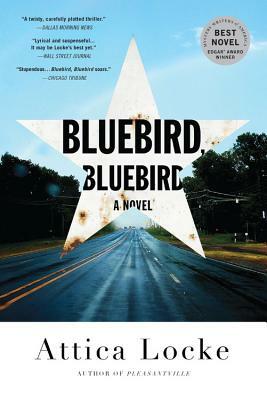 "Attica Locke's Bluebird, Bluebird reads like a blues song to East Texas with all its troubles over property, race, and love. Taut where it has to be to keep a murder investigation on its toes, this novel is also languid when you need to understand just what would keep a black woman or man in a place where so much troubled history lies. This novel marks Love's (and Hatred's) comings and goings amongst black and white, and all the shades between. Locke's small town murder investigation reveals what lies at the heart of America's confusion over race." "With Bluebird, Bluebird Attica Locke brings freshness and vitality to a beloved form. Her storytelling touch is just so strong! From the first beautifully done scene until the finale, this is a very propulsive novel concerning old deeds that keep influencing the present, injustice and courage--a powerful and dramatic look at contemporary black life in rural America." "Attica Locke knows how to tell a tale, her voice so direct and crisp that the dust from the side of Highway 59 will settle on your hands as you hold Bluebird, Bluebird. Nothing comes easy in Shelby County, where the lines between right and wrong blur a little more with each heartfelt page, and love and pain live together as one under the big Texas sun." "This is Attica Locke's best work yet-and if you've read Pleasantville you know that's saying something. Just by her choice of protagonist (an African American Texas Ranger, tacking between two worlds as he solves a double homicide) you know Locke is a writer who makes bold choices, and whose fiction is powerfully connected to our troubled world."